Four Seasons Resort is on the ATV Trails! 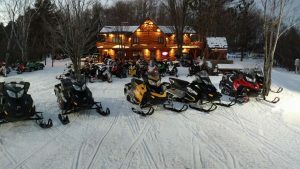 Four Seasons Resort is located in southern Bayfield County – the home of some of the best ATV/UTV trails in the Midwest! 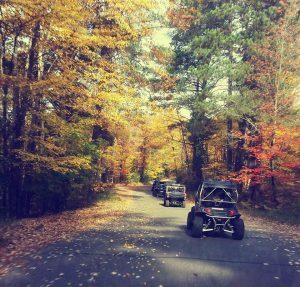 Start Your Four Wheeling Adventure at Four Seasons Resort! Thanks to a recent decision by the Town of Namakagon, guests staying at Four Seasons Resort can now ride their ATVs and UTVs right from your cabin rentals and connect to the off road trail system. 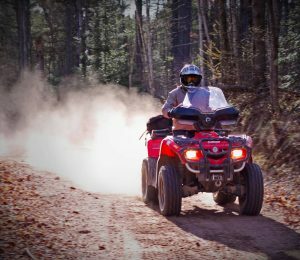 Bayfield County is home to over 180 miles of ATV/UTV trails – with connecting trails to hundreds of more miles of trails in neighboring Northern Wisconsin Counties. And you can now explore Bayfield County’s natural scenery on your ATV or UTV right from the front door of your cabin at Four Seasons Resort! 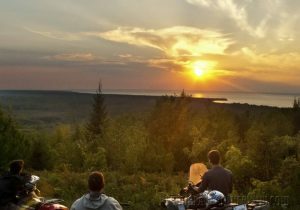 The ATV and UTV trails wind through the Chequamegon National Forest and its glacially sculpted features – some of the most remote and beautiful scenery in Wisconsin! Climb hills, cruise by picturesque lakes and ponds, experience breathtaking vistas and encounter wildlife. Please be courteous to your fellow resort guests and our neighbors. Please avoid excess noise and exhaust as you are coming and going from the resort. Trails and roads under National Forest jurisdiction are open to UTVs 50 inches wide or less. We know how much fun riding the trails can be and we ask you to help us keep the dirt, dust and mud under control in our homes. An additional cleaning fee of up to $500 will be applied if there is significant cleaning required to remove mud and dirt or damage is done to the cabins. The Valhalla Area Trails wind through the Chequamegon National Forest connecting the Valhalla Winter Sports area with the Tri Country Corridor and the Battle Axe Trail comprising over 50 miles of riding. Be sure to make a stop at the Old Baldy lookout accessed off of the Battle Axe Trail. 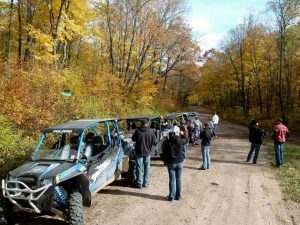 Lenawee ATV Trail-16-mile scenic, winding, timberland trail in the Chequamegon-Nicolet National Forest in central Bayfield County. Trail is mostly sandy-surfaced. Panoramic views. Connects with the Battleaxe and Tri-County Corridor Trails. Call to be sure trail is open. The Tri County Corridor is an old railroad grade between Ashland and Superior, Wisconsin. While it is not a Forest Service trail, it provides an important link to towns around US Highway 2. This trail is paved with crushed limestone. The rest of the ATV trails are on gently rolling to hilly terrain forested with aspen, jack pine, red pine and oak. A majority of the trail tread is sandy. These trails are designated dual use routes for both ATV’s and snowmobiles. Trail Lengths: Battle Axe (Trail 3) 4 miles, Lenewee (Trail 4) 11.8 miles, Iron River (Trail 31/5) 19 miles, Valhalla (Trail 5) 15 miles, Moquah Spur (Trail 63) 4 miles, Ridgetop 1 mile, Tower 1 mile, Buckskin 12 miles, Bear Paw 13 miles, Totagatic 5 miles, Washburn 1 mile. Dead Horse Run ATV trail-The entire Dead Horse System is 56 miles. Most of the trail system is located on snowmobile trails with a tread about 14 feet wide. Much of the trail has a firm tread; however, some sections are located on wetter soils and pools of water may be present on the trail. In addition to bringing tools and perhaps fuel, one should consider a tow strap in your kit. This trail system has few opportunities for purchasing fuel. Trailheads-Highway 77 – A small trailhead is located on the east shore of Dead Horse Slough about 2 miles east of Clam Lake. From the intersections of State Highways 13 and 77, drive 11 miles to the trailhead, which is on the right (north) side of the highway. Chequamegon-Nicolet Great Divide Trail-160 miles of snowmobile trails in Ashland, Bayfield, and Sawyer Counties. These trails are part of the county snowmobile trail systems and include trails such as Route 8, Route 25, and Route 21. Trails are utilized for snowmobiling in winter months and ATV trails in summer. If you are visiting from out of state and will have your ATV in Wisconsin less than 15 days, you need to get a non-resident ATV trail access permit. If you will be housing your ATV in Wisconsin more than 15 days, you need to register it with the state. Your ATV can be registered in Wisconsin and your home state simultaneously. If you are born after 1988 and are at least 12 years old, you’ll need to have an ATV safety certification from either Wisconsin or your home state. Kids under 12 can ride a 90 cc or less ATV as long as they are wearing a helmet, stay only on designated ATV trails and are accompanied by a parent or guardian over 18. Remember that trail conditions can change quickly so please LIKE US on FACEBOOK and check FOUR SEASONS RESORT’S FACEBOOK PAGE for trail reports, photos and resort happenings!